The next scariest thing to the death of a loved one is having them forget everything about you. 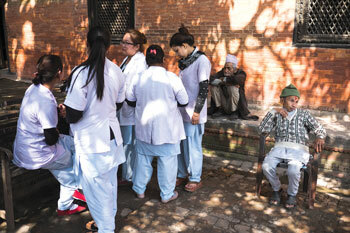 As Nepal’s population ages, Alzheimer’s disease and other types of dementia are expected to rise exponentially, and public health experts say the government needs to start working out a plan to cope with this epidemic. There are an estimated 78,000 people with dementia today, but this is expected to rise to 285,000 by 2050. The World Health Organisation (WHO) has described dementia as a tidal wave that will hit unprepared governments with 47.5 million people suffering from the illness. Alzheimer’s disease, which accounts for up to 80 per cent of the cases of dementia, causes memory loss and affects other mental abilities that interfere with daily life. Dementia is an umbrella term for other neurological conditions that affects brain function, not necessarily just memory loss. Unfortunately, current treatment of dementia merely slows down the progression of the disease, and without a cure anytime soon the only antidote is to provide healthcare personnel with professional training. Last week, the Alzheimer and Related Dementia Society Nepal (ARDS Nepal) organised a workshop for government ministers, advocacy groups, non-government organisations and other concerned parties to form a Nepal Dementia Action Alliance and to draw up a Fight Dementia Action Plan. At the National Dementia Workshop, Francis Wong who is the Regional Director of Asia Pacific Region for Alzheimer’s Disease International, raised concerns over the challenges Nepal faces in dealing with this crisis. “Due to the low awareness of dementia and a lack of knowledge of how to better manage this condition, people with dementia and their families in less developed countries like Nepal generally do not have access to diagnosis or services,” he said. During the workshop, representatives from Alzheimer’s Australia Vic (AAV) taught health professionals valuable skills in dementia care, from the way they should communicate with dementia patients to conducting of activities. Amelia Suckling of AAV stressed the importance of collaboration with local stakeholders in order for the action plan to be effective. The Ministry of Health and Ministry of Women, Children and Social Welfare also said they would include a budget for dementia in the next fiscal year. While it may not be of a concern to those who have yet to care for a loved one with dementia, Ann Reilly of AAV said that will not be the case very soon and Nepal has to be prepared for the worst to come. “With increasing number of people with dementia, there will also be more and more people with a reason to understand dementia,” Reilly said. As Nepal’s youth bulge ages, its ageing population will grow three times faster than the national average due to the increase in life expectancy. Yet, society is still struggling with lack of awareness and the social stigma of having an elderly in the family with dementia, often preventing help from being rendered. While we wait for a cure, Nepali families desperately need more awareness about the disease, quality dementia services that provide residential care, diagnosis, training for healthcare professionals, as well as providing drugs for Alzheimer’s disease at a subsidised cost. Waiting for tomorrow is not an option. 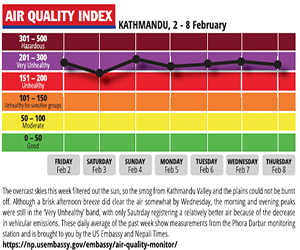 After all, many young Nepalis today may be afflicted with the disease later on in life. Will hugging trees in Garhwal, India, save them this time around? Prachanda Path is deviating from Mao Zedong thought. A gallery of dramatic pictures of Nepal taken from orbit.